On the night of Sept. 6, 1870, while sailing off Cape Finisterre in a freshening gale, Captain abruptly capsized and sank like a stone. She took with her 473 of her crew, including Captain Coles, who was on board as an observer on the voyage. Midshipman Leonard Childers, son of Sir Hugh Childers (Coles' principal patron at Whitehall) also died, as did the Captain's commander, Hugh T. Burgoyne, VC. Burgoyne had ordered shortening of sail just before the capsize. He survived the sinking, but was not among those rescued. There were only 18 survivors of the disaster, all of whom made it to a boat which wrenched free of the sinking ship. They were rescued late the following day. Captain was constructed largely as a result of pressure from the public and media of the day. She was criticised by some of the naval authorities for her apparant instability. But her trials seemed to prove her detractors wrong. 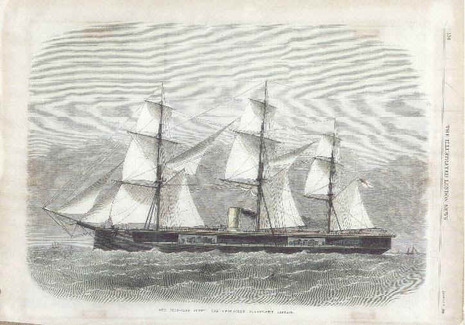 On 6th September 1870, she was cruising with the Channel Fleet off Cape Finisterre, Northern Spain. Shortly after midnight, the wind strength increased, and she was apparantly hit by a large wave at around 1215AM. She heeled over beyond her safe limit of 21 degrees, and started taking on water. She capsized and sank quickly, taking 472 of her crew with her, including Captain Burgoyne and her designer, Coles. Eighteen survived, 1 officer and 17 ratings. On the afternoon of 6 September 1870 Captain was cruising with the Channel Squadron of 11 ships off Cape Finisterre. The ship made 9.5 knots under sail in a force six wind, which was increasing through the day. The commander in chief was onboard to see her performance and speed had risen to 11-13 knots before he departed. Not being accustomed to ships with such low freeboard, he was disturbed to note that at this speed with the strengthening sea, waves washed over the weather deck. The weather worsened with rain as the night progressed and the number of sails was reduced. The wind was blowing from the port bow so that sails had to be angled to the wind, speed was much reduced and there was considerable force pushing the ship sideways. As the wind rose to a gale, sail was reduced to only the fore staysail and fore and main topsails. Shortly after midnight when a new watch came on duty, the ship was heeling over eighteen degrees and was felt to lurch to starboard twice. Orders were given to drop the fore topsail and release ropes holding both topsails angled into the wind. Before the captain's order could be carried out, the roll increased and she capsized and sank with the loss of around 480 lives, including Coles himself. The First Lord of the Admiralty, Hugh Childers, and Under-Secretary of State for War, Thomas Baring, both lost sons in the disaster. Only 18 of the crew survived by making it to a boat which had broken free. The subsequent investigation, under Sir James Hope, took place on board HMS Duke of Wellington, in Portsmouth Harbour. It was somewhat of a departure for the Admiralty to seek scientific advice but eminent engineers William Thomson (later Lord Kelvin) and William John Macquorn Rankine were appointed to the enquiry. It concluded that the ship was insufficiently stable: at 14 degrees heel (when the edge of the deck touched the sea) the Righting Moment (torque) due to the buoyancy pushing the ship upright again was just 410 foot-tons (1.2MNm). 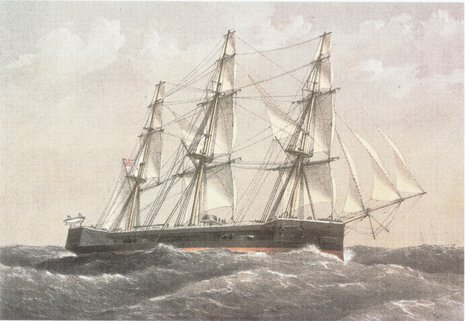 HMS Monarch, the masted turret ship proposed by the 1865 committee and designed by Reed, and which was also at sea at the time of the sinking, had a righting moment of 6,500 foot-tons (20MNm) at the same angle. Maximum righting moment occurred at a heel of 21 degrees, and thereafter declined to zero at 54.5 degrees. Monarch's righting moment increased to a maximum at 40 degrees.